The updates are happening throughout the ship, starting with a new atrium lobby that showcases art deco design inspired by the sea. 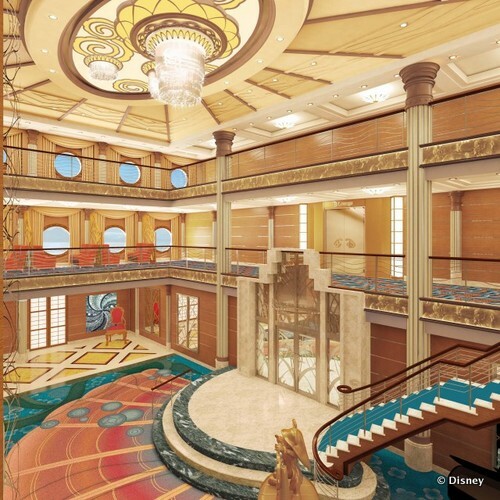 The three deck lobby will feature custom made carpets full of coral, blue, and aquamarine designs. A chandelier inspired by the sun's rays will have overhead, while the grand piano and portholes the recall the early 20th century ocean liners. The centerpiece of the lobby is a cold-cast bronze statue of Helmsman Mickey, which is also going through a makeover. 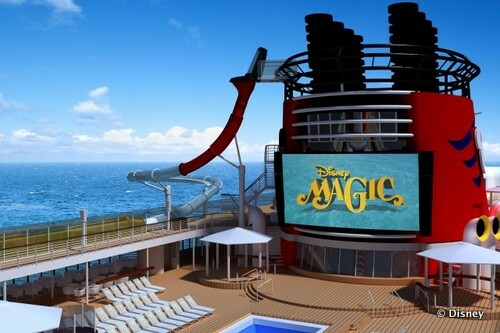 The Disney Magic is going to be a great ship for adventure seekers. The AquaDunk takes cruisers on a brand new "thrill slide" that begins with a nearly vertical launch and then plunges guests down a translucent 20 foot tube over the side of the ship. Other water fun includes the AquaLab, an interactive water playground for kids ages 3 and older with the Twist n' Spout, a water slide with more than 250 feet of loops and turns. The Nephews' Splash Zone, starring Huey, Dewey, and Louie is just right for kids under 3. Marvel is coming to the Magic with the Marvel Avengers Academy inside The Disney Oceaneer's Club. At the Academy, young crime fighters are transported to a S.H.I.E.L.D. base featuring displays with some of the equipment used by The Avengers, including Iron Man's suit of armor, Captain America's shield, and Thor's hammer. 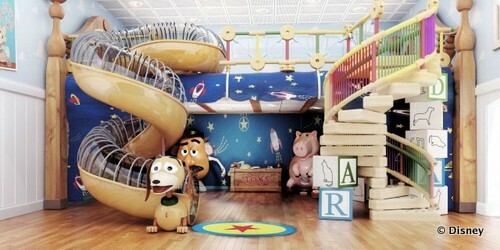 Kids can also stop by Andy's Room where the stars of the Disney/Pixar Toy Story trilogy come to life and Pixie Hollow, where they will be magically shrunk to pixie size and can make crafts or play on computers. 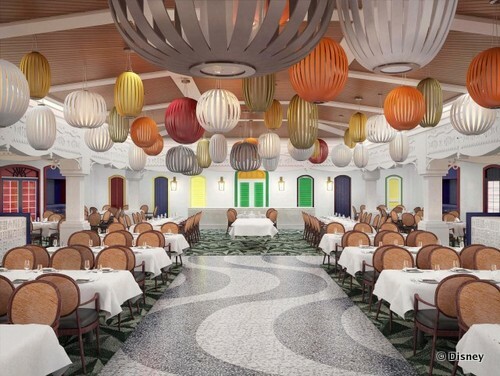 Food is part of the adventure of cruising, and the Magic will feature new restaurants and new technology. A new experience called "Drawn to Magic" at Animator's Palate will include Disney and Disney/Pixar characters such as Rapunzel from Tangled and Remy from Ratatouille. Guests can also visit a Rio de Janeiro-themed eatery, Carioca's, named after Donald Duck's parrot in The Three Caballeros. Cabanas, is a casual dining experience inspired by the Australian setting of Disney/Pixar's Finding Nemo. These new restaurants replace Parrot Cay and the Topsider Buffet. There's new fun for adults on the Magic too, including After Hours, the nighttime adult entertainment district that includes the nightclub Fathoms, the Keys piano bar, and O'Gills Irish pub. Other additions to the Magic include the Sense Spa & Salon, a Smile Spa offering teeth whitening, and the D Lounge which offers family-friendly games, dances, and activities. I'm so excited about these changes! I'm booked on the post-dry dock Magic and now I *really* can't wait!! These changes sound awesome and definitely would encourage me to consider booking a future cruise on the Magic instead of the newer ships (before I was sticking to the newer ships because they sounded nicer, but these additions make the Magic sound pretty great too!). I actually would prefer if they leave this ship alone. I like the way it is. I am not to happy with the changes that are going to be made. Do you think they'll do these updates on the Disney Wonder as well? salejune - I do think that something similar will happen to the Wonder. Right now the rumors say that it's scheduled for a long dry dock sometime in 2014. I wouldn't be surprised if we get some big changes there as well.